Cleveland Browns strong safety T.J. Ward (43) intercepts a pass and runs into the end zone for a touchdown during the fourth quarter against the Buffalo Bills at FirstEnergy Stadium. BEREA–T.J. Ward thinks he’s playing well. In fact, he thinks he deserves to play in his first Pro Bowl after the season. "I think I had a Pro Bowl season," Ward said. "I know I had a Pro Bowl season, but like I said it’s up to the fans and the other players. If you get the other player’s and coaches’ respect then that helps." The question is do his peers in the NFL among the players and coaches think so. Recently, Ward made a video with a local comic trying to drum up votes from the fans for the Pro Bowl. 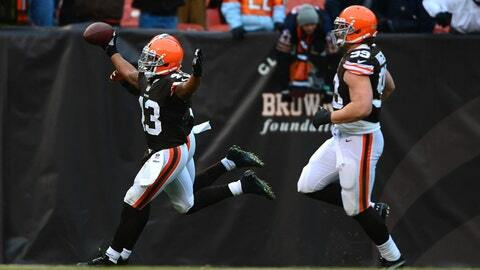 Arguably, Ward has had his best season in his fourth year with the Browns. He is second on the team with 121 tackles, including 15 tackles for loss. He also has 2 sacks, 9 passes broken up and two interceptions. He also has scored two touchdowns. He returned an interception 44 yards for a score to seal a victory over the Bills and picked up a fumble and returned it 51 yards for a touchdown against the Bears two weeks ago. Ward’s numbers certainly make the case in comparison to last year’s AFC representatives at strong safety. Last year’s AFC representatives at strong safety were the Chief’s Eric Berry and the Jets’ LaRon Landry. Berry has 73 tackles this year with three interceptions and 3.5 sacks. Landry, who joined the Colts this season, has 81 tackles with no interceptions and no sacks. Perennial Pro Bowl strong safety, Troy Polamalu from the Steelers missed much of last year with injuries. In 2013, he has 66 tackles with two interceptions and two sacks. "It’s not an individual game by any means, but personally I do feel that I’ve had a really good season, and I pride myself because I’ve put a lot of work in since Day One and it is satisfying when your hard work pays off," Ward said. "We haven’t had the team wins and victories, but those will come. Those will definitely come if everyone starts doing those types of things and finishing things off, you’ll start seeing a lot more wins." However, Ward wants to focus on the task at hand. Finishing his first season in three years healthy with a win over the Steelers. Ward would become an unrestricted free agent if the Browns don’t re-sign him by March 11, thus this could be Ward’s last game as a member of the Browns. Did his best year with the Browns prove to be his last? "You can’t block that out," Ward said. "I spent four years here and I’ve given a lot to this team and this city and they’ve given a lot to me, so you can’t completely block it out, but I try to stay focused on the task and one week at a time and finish it off right. "I just want to win this last game," he said. "That’s it. Just want to beat Pittsburgh this week and after the season, all that off-season stuff will handle itself and my agent will handle that but I have no control over that right now." Ward was drafted in the second-round (38th overall) of the 2010 NFL Draft from Oregon. Joe Haden was drafted in the first-round and the duo has helped strengthen the back end of the Browns defense. "I definitely want to be back," he said. "I like my team. I love my teammates. I love being in this city. I love the organization. We haven’t had many wins, but I think we’re building something here, and I think it’s being built the right way." Ward said he and Haden both feel they want to see the Browns turn things around. Haden is still signed for another season. "When you start something, I’m a person that wants to finish things and I want to finish things on a winning note," Ward said. "I want to play in the playoffs here. I want to bring this city a championship. I’ve been doing everything in my power to help this team win so I definitely want to see that through. "Sometimes things don’t happen right away," he said. "It takes a little bit of time, but good things are worth the wait in a lot of cases. We’re starting to build something, and if I have the opportunity, I’d love to finish it. "We were brought in here to do a job and a task and to help this team improve and once we start something we want to finish it," Ward said. "We haven’t done pretty well the last four seasons but like I said, we have signs of improvement, signs of a championship quality team and I think there’s a lot of pieces in place here and it’ll be great to finish it off together especially me and Joe coming in together." Ward said he doesn’t know what his future holds with the Browns. "I have no idea," he said. "Really, honestly, I really haven’t even been focused on that part of it. I’ve thought about it, but not really in depth. So we’ll see." If the Browns choose not to sign Ward to a long-term contract, they could place the franchise tag on him to retain him for at least another season. If they choose not to sign him or franchise him, he would enter free agency. "It’s an opportunity that I haven’t had, but who knows?" Ward said. "If I get the tag, I get the tag. "That would be just one more year here," he said. "It is a sort of free agency, but you’re still with the team. So it’s like a one-year contract and I’ve just got to continue to do the things that I’ve been doing. That’s all it is, basically just another year." Rob Chudzinski was asked about Ward and another notable possible free agent in Alex Mack, but he didn’t want to talk about that this week. "(Ward and Mack) have played at a high level," Chudzinski said. "I love those guys, but we’re focused on Pittsburgh right now and in the season. All of those things, we’ll talk about when the season is over." Gordon and Thomas Honored: WR Josh Gordon and OL Joe Thomas each have earned awards from the local chapter of the Pro Football Writers of America (PFWA) for the 2013 season. Gordon was a unanimous selection for the PFWA Player of the Year and Thomas was named the PFWA Dino Lucarelli ‘Good Guy Award’ winner. The pair will be honored at the 34th annual Akron Browns Backers banquet in May at the Tangier Restaurant.